I've been cleaning house and found a stack of old letters my mother sent me. It seems no one writes letters anymore. My mother claims she was a terrible letter writer, always sharing the most boring tidbits, but the news from home was and is always welcome. After spending nearly two weeks in the hospital, my mother has been in rehab for about a week. I've been writing short notes, but think a letter is long overdue. Perhaps even a poem is called for. So today I'm thinking of an epistle. An epistle is a poem read as a letter. One of my favorite epistle poems is by Elizabeth Bishop. Here's an excerpt. So, there's your challenge. Will you share an epistle with me this week? Yes, I know it's Tuesday, but it's been so long since I've been here that I wanted to get this out. I hope a few of you are still out there and will stretch with me. Back in 2008 and again in 2010 we wrote poems in the form of kyrielle. I'd like to do this again, but think we should try a different definition of the form. This one comes from the book Fly With Poetry: An ABC of Poetry, written and illustrated by Avis Harley. Normally on Poetry Friday I peruse my bookshelves and find something I want to share. Here's what my office looks like right now. Our building is being renovated this summer, so this means I must pack up so that carpet and windows can be replaced, walls can be painted, and much more. WHAT A PAIN! I am in serious withdrawl without my books! 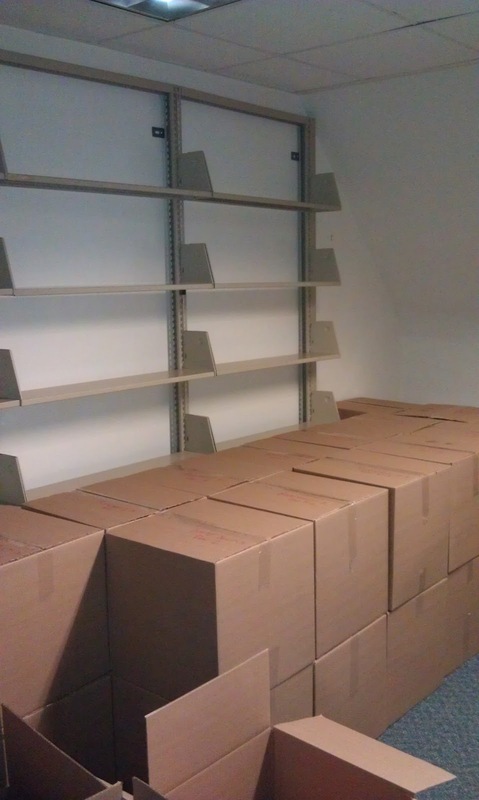 What you are looking at is 26 boxes of books, and my office is only about 60% packed! Since I'm teaching math this summer, I have stubbornly refused to touch these materials. I'll need to find a home for them since I will need them for class. But alas, all my poetry has been boxed. I miss it terribly. This means you get something a little different from me today. Here's Taylor Mali performing Undivided Attention. Now that you've heard it, read the poem in its entirety. The roundup today is being hosted by Irene Latham at Live Your Poem. Do stop by and take in all the wonderful poetry being shared this week. Happy poetry Friday all! So, I've been silent for a while, dealing with family, life, and work. Graduation is this weekend, so now that my grades are done, I'm thrilled to be back with a little something my poetry sisters put together. It started on April 24th with this nudge. Anyone want to go for six days straight of haiku with me -- post yours on blog or facebook and I'll mention you or link to you??? OR, anyone just want to aim for a haiku Friday this Friday -- final Friday of April? Or linked haiku for Friday? One of you guys starts, like right now, and sends it to us. Then someone else uses it as a jumping off point, writes her own, sends it to us, etc. They're just haiku so we should easily have a whole batch by Friday? Anyone want in? If so, who's ready to kick us off???? Everyone needs a nudger in their writing group, the one that gently prods or suggests something outrageous. That's Liz. She started the fire at 4:00 pm. At 4:19, here's what showed up in the inbox. I'm in! I've been doing a haiku or senryu every day, too. So short. But just keeping up... I do mine very fast, down and dirty. No revision, so they're not polished at all. Just warning you. That was Laura. By 6:31 pm, every member was in, except Tanita. Now, she's across the pond, so we can forgive her the difference in time because she was right there the next morning. New pieces started coming in (isn't it wonderful to have poetry arrive in your mailbox? ), and then Andi threw out this idea. These are wonderful! I am so glad it is spring and your poems are full of green and tart. I can't remember now if we started this game based on the Japanese tradition of haikai? Maybe it wasn't mentioned yet so I will bring it up. The earliest Japanese haiku started from a poetry game the masters used to play with each other. One person wrote a three line, 17 syllable haiku. The second person added a two line verse that linked to the first but also shifted slightly to another theme/topic. Then the first, or a third person added a three line verse. On and on it went, always with a link and a shift of topic. So you had a braid of poetry that could go on for ever. Over time the three line verses stood alone and became haiku. What if we tried inserting two line verses between our haiku? Don't you just love smart, creative people? And so, after some online collaboration, we have a lovely little daisy chain haiku/renku. Heck, I'm not sure what to call it, but it's a beauty. Here's my contribution. You can read all the contributions over at a wrung sponge or the individual blogs linked below. Thanks to Liz, Laura, Sara, Tanita, Kelly and Andi for taking the time to do this and for once again sharing their amazing talents. Head on over to their blogs to see what they had to say. The roundup for today is being hosted by Elaine at Wild Rose Reader. Do stop by and take in all the great poetry being shared.